Various hydrological and meteorological variables such as rainfall and temperature have been affected by global climate change. Any change in the pattern of precipitation can have a significant impact on the availability of water resources, agriculture, and the ecosystem. Therefore, knowledge on rainfall trend is an important aspect of water resources management. 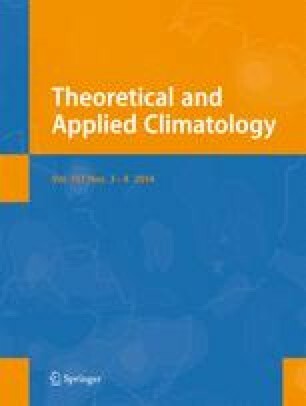 In this study, the regional annual and seasonal precipitation trends at the Langat River Basin, Malaysia, for the period of 1982–2011 were examined at the 95 % level of significance using the regional average Mann–Kendall (RAMK) test and the regional average Mann–Kendall coupled with bootstrap (RAMK–bootstrap) method. In order to identify the homogeneous regions respectively for the annual and seasonal scales, firstly, at-site mean total annual and separately at-site mean total seasonal precipitation were spatialized into 5 km × 5 km grids using the inverse distance weighting (IDW) algorithm. Next, the optimum number of homogeneous regions (clusters) is computed using the silhouette coefficient approach. Next, the homogeneous regions were formed using the K-mean clustering method. From the annual scale perspective, all three regions showed positive trends. However, the application of two methods at this scale showed a significant trend only in the region AC1. The region AC2 experienced a significant positive trend using only the RAMK test. On a seasonal scale, all regions showed insignificant trends, except the regions I1C1 and I1C2 in the Inter-Monsoon 1 (INT1) season which experienced significant upward trends. In addition, it was proven that the significance of trends has been affected by the existence of serial and spatial correlations. The authors would like to sincerely thank the Ministry of Science, Technology and Innovation (MOSTI) for the financial support given to the research project entitled “Modeling Water Resources and Storm Water Management Strategies for Large Scale Dual-Function Rainwater Tanks Incorporating Climate Change and Urbanization Scenarios.” The authors would also like to express their appreciations to the Hydrology Division, Department of Irrigation and Drainage at Ampang, Selangor, and the Malaysian Meteorology Department at Petaling Jaya, both under the Ministry of Natural Resources and Environment (NRE), for the provision of the climatic data.